Well, since it’s Halloween, I decided I wanted to do something a little different. Specifically, a horror movie marathon of some of the bigger names on my list than I never got around to. Plus, at the very end I’m going to do a ranking of all the movies I’ve seen, along with a few favourite categories to celebrate. Premise: The wife and the mistress of a scummy headmaster get together to plot the man’s murder. After seemingly pulling off the crime, they are surprised when his body disappears and strange things start happening. Could the man secretly be alive…? 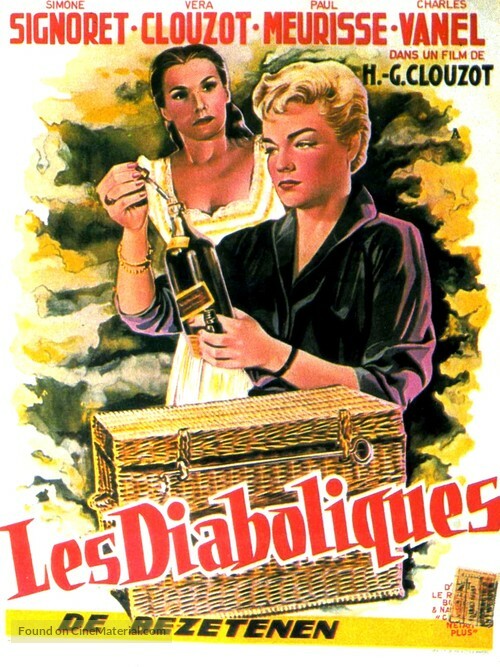 Starting of my Halloween Horror marathon with a very classic French thriller that inspired the likes of Hitchcock. Or Psycho, at the very least. Been looking forward to seeing this one for a pretty long while but… honestly, I was a little bit disappointed by it. I think a decent part of this might have been that I just watched Eyes Wide Shut the day previous, a movie that shares a lot similarities with this, but that I thought was done a lot better. Besides which, this movie shares a lot in comparison with Psycho (little surprise since it was a direct inspiration) and I’ve never really considered Psycho one of Hitchcock’s best in my eyes (although, like this movie, it does have more than a few standout scenes and moments). Still, something about this just felt kinda lacking to me, like it didn’t have the kind of tension and suspense I was expecting, minus a few key moments. Now, I’ll admit that part of this might have been down to knowing the big twist beforehand, which obviously changes a lot how you view the movie. But honestly, I’ve never really found knowing spoilers to really negatively affect seeing a movie for me all that much, even with movies that are heavily predicated on their twist like this one. (On the contrary, I’ve found it tends to let you appreciate the foreshadowing and execution significantly more). Yet something about this clearly didn’t quite work for me. Perhaps it’s just that so many other movies have taken from Psycho and, by extension, this, that the tropes and techniques that made it so effective for its time just feel a bit stale to me. Who knows? Still, even if I was underwhelmed by it, I won’t call it a bad movie. It has a simple but effective premise and some interesting twists and strange turns here and there. The acting is solid and the dialogue is decent. Plus the infamous climax is fantastic, in spite of me already knowing the twist. I can see exactly where and how the likes of Hitchcock were inspired by it, even if I think he ultimately did a better job with the techniques used, so in that regard this film deserves its place in movie history canon. It just didn’t do all that much for me, is all. Was is Scary? : I felt like Hitchcock did a lot of it better, but this still has some standout scenes. Especially the bathtub scene at the end.